Mrs. Sheila Sri Prakash, the Chief Architect and Founder of Shilpa Architects, has been invited to participate as a Special Guest at SHARE International & Engineering Forum Bucharest 2017 edition. The program is organized by PRO Event in cooperation with the Romanian Order of Architects and ABplus events. SHARE BUCHAREST 2017 program contains over 70 presentations, interactive debates, thematic panels and networking sessions. 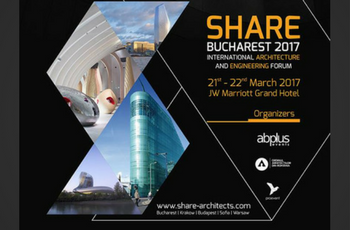 SHARE BUCHAREST 2017 is a dynamic event that includes four professional conferences organized during two days, on 21 and 22 March, at Marriott Grand Hotel Bucharest: INGLASS – International glass architecture and engineering expo conference, LAUD -International landscape architecture & urban infrastructure expo conference, GIS – International interior architecture and design expo conference) and CONTRACTOR – International building services engineering expo conference. Romanian Public Television Channel in Bucharest interviewed Mrs. Sheila Sri Prakash and the program was televised on April 23 at 11:00 PM at Bucharest. Here is a Link to the Interview.